With temperatures reaching an all-time low here in Ohio, we thought it would be fitting to share a few tips to help you prepare for your move in the winter months. 1. Prepare your new location for the move. Before moving day, we recommend that you check with your real estate agent or rental manager to ensure that your house is ready to be moved into. It’s important to make sure that you have lighting and heat prior to moving all of your belongings into the household. Ensure that all of your utilities have been set up and are fully functioning. You’ll want to ensure that you have proper lighting and heating to ensure that the move goes as quickly as possible in the cold weather environment. 2. Ensure that the parking area is clear. It’s important to make sure that you have a place for the moving truck to park in tough weather conditions. If your drive is not plowed, our movers will have to park further away, causing a longer unload time. 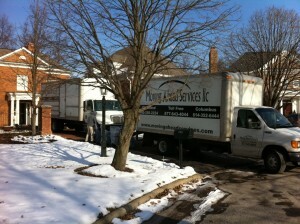 Our movers will shovel paths to ensure all your items are safely moved into the household. Using large pieces of cardboard or floor mats will ensure that no damage is done by incoming snow or salt. We offer services to combat the elements while moving, and it’s important to consider these services to prevent a messy move. 4. Check the weather often. If you know a winter storm is rolling in, it’s important to keep up-to-date with the latest weather conditions. There are three stages of Emergency Snow Classifications in Ohio, and our moving services will operate in stags 1 and 2. If you are concerned about weather conditions, you can always reach out and reschedule your move. 5. Prepare with warm drinks and gear. On a cold day, hot coca and a pair of gloves can go a long way. Make sure that you did not pack away all of your warm clothes and ensure that you have a warm hat, gloves, clothing, and proper footwear. Having a few warm drinks on hand can also help ease the cold weather.